The Australian slots are not less popular. 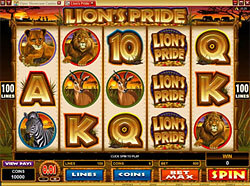 However, the gambling machines or the so called poker machines or pokies are termed gaming machines in Australia. Australian style slots make use of the video displays for physical reels simulation. It is interesting to know that in the 1950s the Australian Aristocrat Company managed to develop the first Slots in Australia called the Clubman. However, two years later with more advanced and improved slots they revised the previous version and called it the Club master. Nevertheless, it was widely accepted in Australia that the priority of slot machine foundation belonged to the USA and Charles Fey, particularly. Anyway till the 1900s the slots finally managed to hit Australia. It was in 1956, when NSW Government of Australia resorted to the gaming machines authorization in clubs. However, the further years did not offer anything innovative in the sphere of the gambling technology. All the slot machines disposed 3 reels that were spinning and also 5, 3 or 1 line with the symbols. It is interesting that the jackpots of that time were much lower. In addition, the interactivity of the game was very limited just to pulling the lever and simply waiting for the outcome where reels stop. It was common until the mid-1980s. In Australia the very first video slots were introduced in production lines and very soon were accessible for the gambling public. For slots in Australia it was indeed the second greatest achievement after the Charles Fey's invention. 5 reels were introduced in addition to the innovative features like multi linear, extra ways of earning like free spins and bonuses. In modern gambling world of Australia it is possible to see such slot machines everywhere: from casinos to clubs. They are considered to be the major gambling and entertainment sources. Pokies are the slang term for Australian slots machines. Though there is no definite date of pokies term first usage, however the word is very popular among the local gambling clientele. "I am off to the club to play pokies" is the favorite phrase of nearly every venturesome Australian. In Australia slot machines can be found all around the country in larger cities in different gambling establishments like casinos, clubs (social, sports, etc. ), and pubs. It is interesting to discover that the first state of Australia that was allowed for gambling was New South Wales and it happened in 1956.